I’m having a very self-indulgent morning. I was hoping to listen to an episode or two of ‘Poetry Please‘ but for some reason all the episodes from 2012 -2013 listed at the BBC iplayer site are ‘not currently available’. So then I moved onto the Poetry Archive for inspiration. I’m sorry to say I was a little bit disappointed with the Elizabeth Bishop recordings. Much as I love her work I wasn’t grabbed by her delivery of the few (quite long) poems on offer here. Perhaps I ought to learn some stamina. 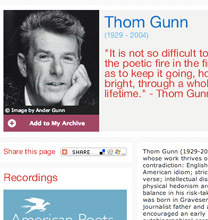 But Thom Gunn was another matter – I haven’t read anything by him since schooldays but I’m now motivated to seek him out, having read and listened to the two poems recorded here – Moly, and Considering the Snail. Many things about both these poems really appeal to me, and I love his delivery in a british-american hybrid accent (I’m avoiding the rather sleazy word ‘transatlantic’.) Worth a listen. Have a lovely indulgent weekend! Thanks for commenting, Jean. I thought I’d end up feeling inspired to write, but I hardly managed a word all weekend. Maybe that’s what comes from having too much free time all of a sudden!